A Spiritual Treasure Trove from a Veteran of the Faith. This compilation of daily devotional readings emphases the focuses of Andrew Murray's writing and preaching-holiness and the deepening of the spiritual life. Included are selections from such classics as Humility, The Full Blessing of Pentecost and Waiting on God. Whether you have been blessed for years by the ministry of Andrew Murray, or are just meeting him for the first time, these bite-sized reflections will lead you in a day-to-day development of a holy life. Daily Thoughts On Holiness by Andrew Murray was published by CLC Publications in November 2011 and is our 30713th best seller. The ISBN for Daily Thoughts On Holiness is 9781936143481. Be the first to review Daily Thoughts On Holiness! Got a question? No problem! 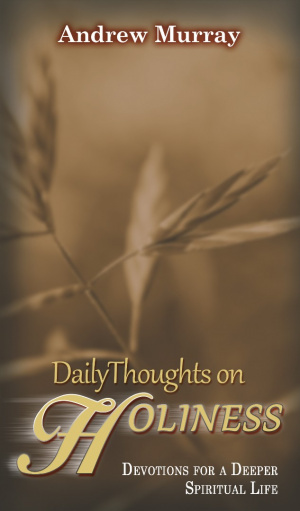 Just click here to ask us about Daily Thoughts On Holiness.